Welcome to the School of Architecture, Planning, and Preservation. You are on the Visual Resources Collection Blog – MAPPimages. Check here for information about relevant new images, training session times, who is who and what is what. Please check out the School’s Facebook page – http://www.facebook.com/pages/Maryland-School-of-Architecture-Planning-Preservation/200576986628466. Latest posts include pictures from the Summer Study Abroad programs to Scandinavia, and Saint Petersburg, Russia. Wednesday August 22, 2012 is the new graduate student open house, so I will be talking about the cameras, video cameras, lights, tripods, Flat panel TV’s and images that you can borrow. 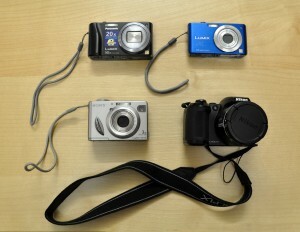 Cameras that students may borrow. 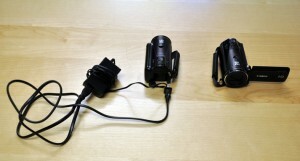 Tripod can be used with video cameras as well as the point-and-shoot cameras.